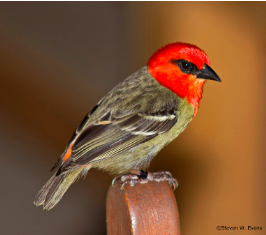 Before 2009 the Mauritius Fody Foudia rubra was listed as Critically Endangered, but it was downlisted to the Endangered category in 2009 due to intensive, successful conservation management. The management included releasing hand reared chicks onto Ile aux Aigrettes (see news item). Populations of 216 adults on the mainland and at least 110 adults on adjoining Ile aux Aigrettes suggests that the population is now well over 300 adult individuals, with the overall trend stable, undergoing moderate fluctuations or increasing. Thus there is a proposal to downlist this species to Vulnerable - read more, and provide comments, at the BirdLife International forum.